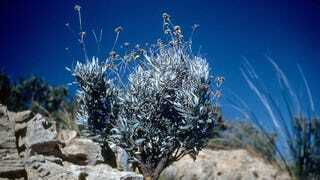 Guayule is an little-known desert shrub, largely unremarkable except for one thing: It’s full of latex. That’s right, the stuff used to make rubber. Big tire manufacturers like Bridgestone are now betting on guayule as the next big thing. But didn’t we solve the rubber problem with synthetics decades ago, you might ask? Not quite. Natural rubber is still used almost exclusively in the toughest situations, like on airplanes and trucks. That’s because its polymers align perfectly to form an extra-strong crystal structure under stress, aka when a truck slams on its breaks. But natural rubber has its downsides, too, largely because the rubber plant is a fickle one that only grows in the tropics. That means the rubber supply can be easily chocked off by weather, disease, or political instability. It was Japan’s control of rubber during WWII that spurred the development of synthetics in the first place. That’s where guayule—pronounced why-yoo-lee— comes in. Alexander H. Tullo writing in Chemical and Engineering News traces the recent uptick of interest in the plant. Whenever rubber prices have gone up, guayule, which is 5 to 10 percent latex by weight, has come back into fashion. It might finally work this time, but there are still technical challenges. For one, it’s trickier to use than the rubber plant because you can’t just tap it and expect latex to flow. Instead, its latex is locked up in cells, so guayule has to be cut and then latex extracted through a chemical process. The plant also takes a couple years to mature. Big companies like Bridgestone and small startups like Yulex are finding ways to grow the plant economically. If it all works, one advantage guayule does have is what it lacks: namely the proteins that make people allergic to latex. It could one day makes its way into gloves and wetsuits as well as airplane and truck tires.